Most of us have experienced trying to talk to a child and receiving either no response at all or a one-word answer. Honestly, once our kids hit adolescence it can be hard to pry a conversation out of them at all. But as normal as it might be to talk in a bored monotone and use as few words as possible when talking to an adult, it’s just not good manners. 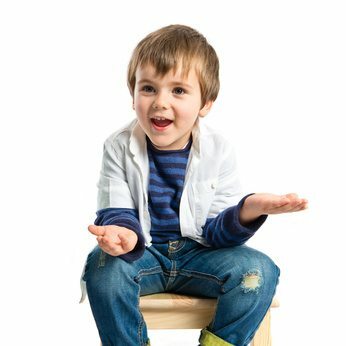 Manners are taught by parents, and if you want to make sure your kid doesn’t come off as rude or sullen as he gets older, you need to give him some tools for having a polite conversation. Check out this story: I was sitting in the dentist’s office the other day as my daughter was getting braces, and in walked a boy of about 16. He grunted a hello to the nurse and sat down in the chair. Finally the nurse gave up and didn’t say another word to the boy. I get it. I remember being 16, and it did always feel slightly horrifying when an adult would talk to me. But all I could think while I sat there in the dentist’s office was how mortified I would have been if that was my teenager, and I wondered if anyone had ever taught him the art of conversation. Some parents might think, well, my kid is just painfully shy. It’s not his fault he doesn’t want to talk to adults. But I don’t believe shyness is an excuse for rudeness. You aren’t asking your child to have a twenty minute conversation with the pharmacist about world politics. You just want to make sure that she knows how to be polite and show a passing interest in other people. 1. Teach them how to ask questions and be curious about others. I love this trick I learned from Dale Carnegie, author of How to Win Friends and Influence People. He claims that a person’s name “is the sweetest sound,” and I agree. It’s always nice to hear someone use our name when they’re addressing us. So if your child is at his friend’s house, and his mom gives him a plate of crackers and cheese, he can say, “Thank you, Mrs. Parker.” Easy as that. Conversation is give and take, and it tends to come more naturally to adults. But that doesn’t mean our kids should get away with not having good communication skills that help others feel listened to and respected. 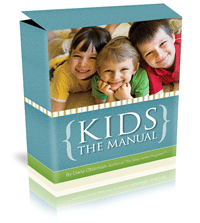 And, if you are looking to teach kids other appropriate behaviors, you can check out Kids: The Manual. It’s a child discipline system for kids aged 2 – 12.